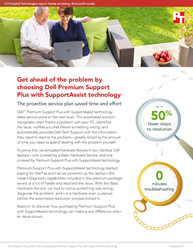 Principled Technologies (PT) found that Dell Premium Support Plus with SupportAssist technology was the only service plan among the four they tested that proactively diagnosed a hardware problem and started the parts replacement process on its own. Premium Support Plus accomplished this by automatically detecting and diagnosing problems when they occurred. Many people purchase PC service plans—just in case they encounter problems with their device. PT proved that purchasing Dell Premium Support Plus with SupportAssist technology can save customers time and effort when something goes wrong. Premium Support Plus accomplished this by automatically detecting and diagnosing problems when they occurred. PT found that top-tier service plans from HP, Lenovo, and Apple do not have this proactive and predictive technology, so customers of those companies must discover and troubleshoot the problem on their own and then reach out to tech support before the diagnosis and replacement process begins.